This page will explain how to document quality measures in TRAKnet and how to run the Quality Measures report. Quality Measures are documented in TRAKnet using one of two different methods. Method 1 – From the patients' chart. On the patients' chart click the Actions drop down and select Quality measures. Method 2 – From the patients' encounter. When creating a patient encounter add the Quality Measures link to the encounter. 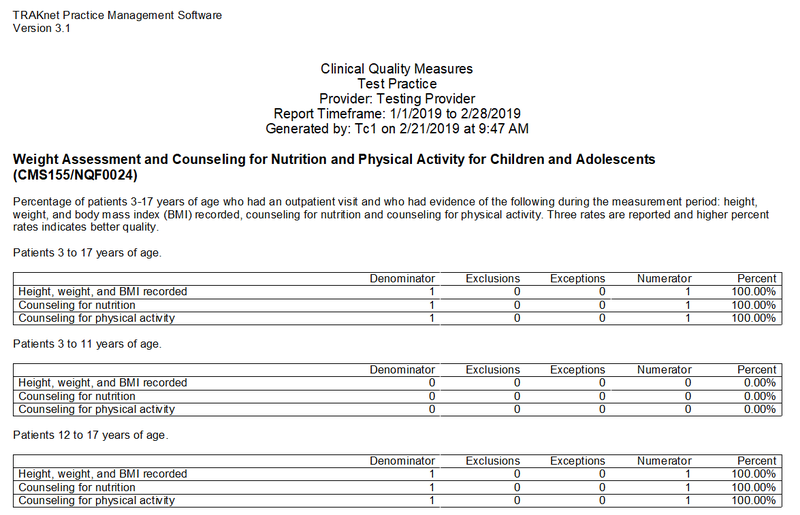 To add a new quality measures record for this patient, click the green Add button in the upper left-hand corner of the screen. This will open the Patient Clinical Measure Factors Editor window, seen below. The quality measure screen is broken down by each criterion. Once all information has been documented, click Save to save this form. To ensure successful completion of these measures, you must link the quality measures record to the encounter where the measures were met. To do this, select the measure in the list, then click Link. Select the appropriate date of service from the list and click OK. There are some measures that are not documented on this screen. 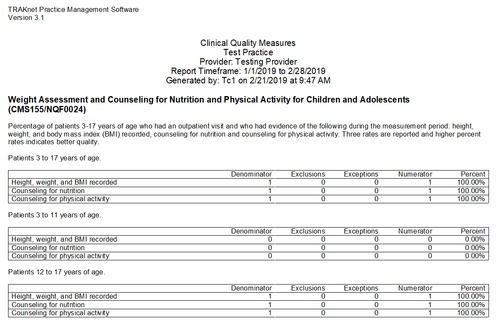 To best understand each CQM measure, we have provided the list of measures in the TRAKnet report below, with a breakdown of their criteria, description, and information. A Quality entry indicating the appropriate referral loop information. This can be completed within an encounter using the Quality Measure link. An outgoing referral for the patient. 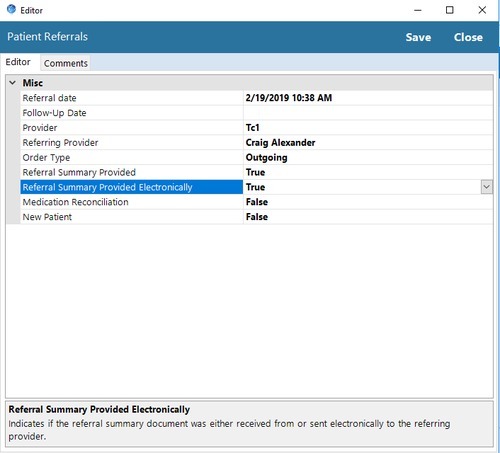 Method 1 - click Actions on the patients' chart and select referrals, then click Add. Method 2 – click referrals on the patients' chart and select the referral management tab, then click Add. Once the patient has qualified for the Denominator the patient can be reported for the Numerator. To Report the patient for the numerator, create an incoming referral entry. Click Actions on the patient’s chart and select referrals, click Add. 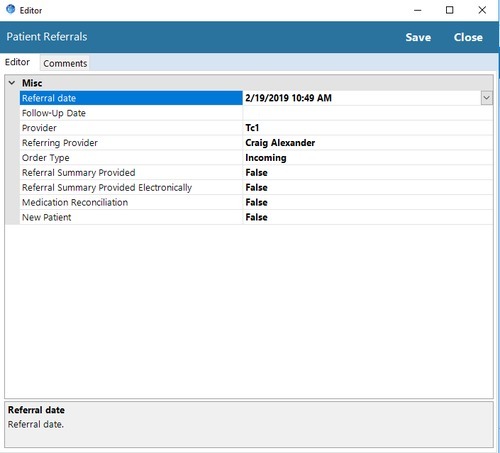 Note that the incoming referral must be for the same provider as the outgoing referral. For patients to qualify for the Denominator they must be 18 years of age to 85 years of age, have a diagnosis of Hypertension and an office visit during the reporting period. Once the patient has qualified for the Denominator the patient can be reported for the Numerator. To report the patient for the Numerator input the patient’s vitals in the patient’s chart and link them to the encounter. 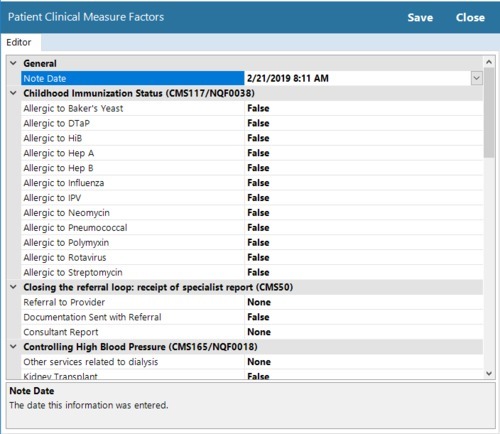 Exclusions can be reported on the quality measures screen. 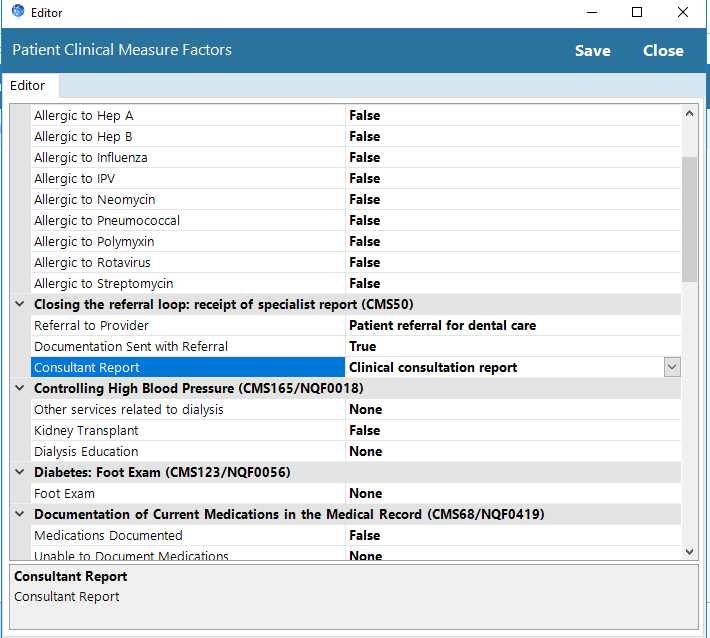 Report quality measures from the patient’s chart by clicking the actions button and selecting Quality Measures. Report quality measures from an encounter by using the quality measures link within the encounter. 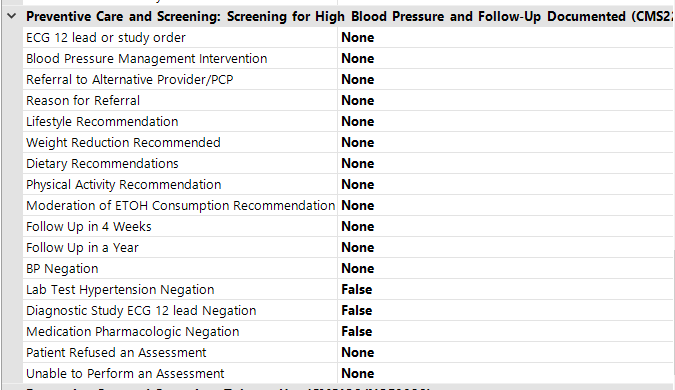 On the quality measures screen scroll down to the Controlling high blood pressure and set the appropriate settings. For patients to qualify for the denominator they must be between the ages of 18 and 75, have a diagnosis of diabetes and have an office visit during the reporting period. Once a patient has qualified for the denominator the patient can be reported for the numerator. To report the patient for the numerator the user must report they have performed a diabetic foot exam from the quality measures screen. On the quality measures screen scroll down to the Diabetes: Foot Exam and select true or false to indicate if a foot exam was performed or not. For patients to Qualify for the denominator in the TRAKnet application, the patient must be between 18 and 75 years of age, have a diabetic diagnosis and an encounter with an office visit code within the reporting period. 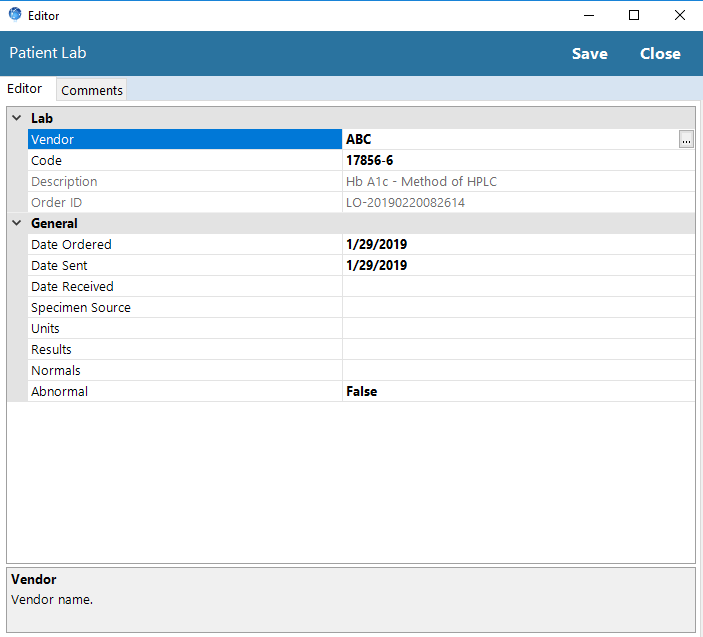 Create a lab order for an Hb A1c test. Click orders on the patient’s chart and select Lab Orders. Click add and enter the Vendor, Code, date ordered, date sent and any other available information. Once the lab results are received, enter the results in the lab order. Note for this measure a lower number indicates better quality so patients will be removed from the numerator if they have a result lower than 9.0%. For patients to Qualify for the denominator in the TRAKnet application the patient must have an encounter with an office visit code within the reporting period. Note that each encounter with an office visit code counts towards the denominator. Once the patient has qualified for the Denominator the patient can be reported for the Numerator. To Report the patient for the numerator, create a quality measure indicating current medications were documented. For patients to Qualify for the denominator in the TRAKnet application, the patient must be 65 or older and have an encounter with an office visit code. Once the patient has qualified for the Denominator the patient can be reported for the Numerator. To Report the patient for the numerator, create a quality measure indicating the patients' current fall risk screening. For patients to Qualify for the denominator in the TRAKnet application, the patient must be 18 or older at the time of the encounter and have at least one encounter with an office visit. Once the patient has qualified for the Denominator the patient can be reported for the Numerator. For the patient to qualify for the numerator they must have a BMI recorded and a follow up plan documented if that BMI is out of normal range. Record the patients Vitals including height and weight (BMI will be calculated according to these). Record the appropriate Quality measure to indicate the screening was completed and a follow up was documented. Once the patient has qualified for the Denominator the patient can be reported for the Numerator. For the patient to qualify for the numerator, they must have vitals recorded for the patient and Quality Measures indicating screening for high blood pressure with a follow up documented. Record the patients Vitals including their blood pressure. Record the appropriate Quality measure to indicate a screening was completed and a follow up was documented. For patients to Qualify for the denominator in the TRAKnet application, the patient must be 18 or older at the time of the encounter and have at least two encounters with an office visit or one encounter with a preventive visit code. Once the patient has qualified for the Denominator the patient can be reported for the Numerator. For the patient to qualify for the numerator they must have a Quality Measures indicating they were screened for tobacco use and received cessation counseling. For patients to Qualify for the denominator in the TRAKnet application, the patient must be between 3 and 17 years of age with an office visit. Once the patient has qualified for the Denominator the patient can be reported for the Numerator in 3 categories. To report for category one, record the patient’s vitals including height and weight and link the vitals to an encounter. Record the appropriate Quality measure items through the quality measures link in an encounter.